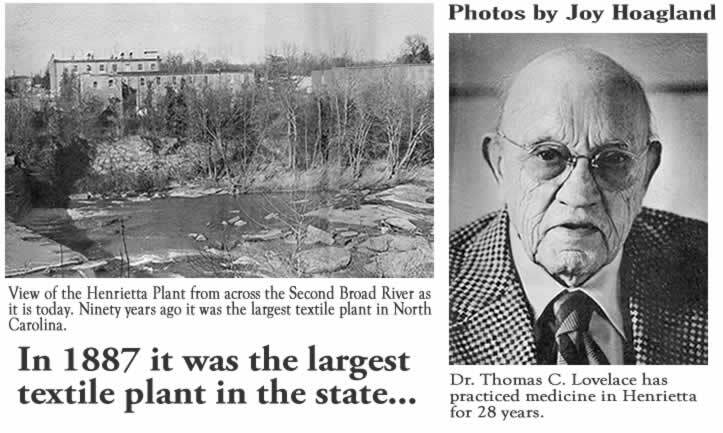 It was thus that the physician who has practiced medicine in Henrietta since 1919, as mill physician until about five years ago, learned that Burlington had decided to close its Henrietta Plant early last August. “I felt it as a personal loss, and for the people that live here,” Dr. Lovelace said. At 88, he still practices medicine four full and two half days a week. 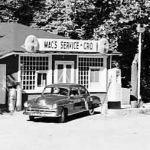 His offices are still located where they have been for, most of his 58 year practice – in the building that once served as the company store and has most recently been used for office space by Burlington. 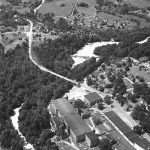 When Dr. Lovelace came to Henrietta to set up practice after returning from France at the end of World War I the Henrietta mill community was vastly different from the community that existed when Burlington closed the plant this year. When it was built in 1887, according to Clarence Griffin’s “History of Old Tryon and Rutherford Counties” the Henrietta Plant was the largest textile plant in North Carolina. The plant was equipped with 5,000 spindles and made gauze fabric. The establishment of the Henrietta Mill was a joint venture between S. B. Tanner and R. R. Haynes. Haynes owned the High Shoals site where the mill is located. According to “The Making of a Southern Industrialist” by Gerald Johnson, Tanner put up $10,000 of his own money, his father-in-law put up an additional $10,000 and an additional $90,000 in capital was raised in Charlotte to finance the venture. Haynes agreed to exchange the High Shoals power site for stock in the company. Tanner’s father-in-law, J. S. Spencer was elected first President of the company, which was called Henrietta Mills after Spencer’s wife whose name was Henrietta, and Tanner was chosen Secretary-Treasurer at the first meeting of the stockholders in 1887. Haynes was elected to the Board of Directors. But he overcame them and once the mill opened it made money “practically from the day the wheels first began to turn” and was yielding a “terrific” return within seven years. It was necessary to provide nearby housing in order to get labor to work in the mill because there was no adequate means of transportation. 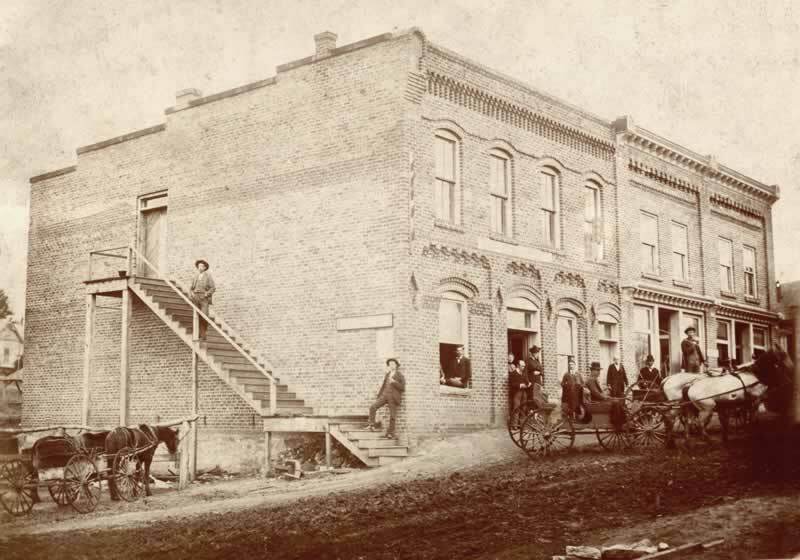 It was also necessary to provide a store where people could purchase the goods they needed and the Henrietta Company Store was the “the biggest company store in the county” according to Dr. Lovelace. “It had a meat market in the basement, and a millinery department, it sold practically anything you could want,” he said. The Mill’s labor policy was “paternalistic to the last degree” in those early days, according to Tanner’s biography. Drinking, disorderly conduct, gambling, profane swearing, prostitution, promiscuity of any kind in fact, was cause for banishment from employment and consequently from the village. Since the peace officers were employees of the company, the company regulations had the force of law. As Johnson pointed out in Tanner’s biography, this paternalistic policy sounds horribly tyrannous, but Johnson also says that there were reasons for the policy. “To begin with,” he says, “The original Henrietta mill, like many others at that time, was built in open country and the only labor supply available consisted of people with not one cent of free capital. This was long before the day of the automobile; so shelter within walking distance of the mill was imperatively necessary. North Carolina had not a single city and the towns were too small to have developed large real-estate operators interested in rental property. The only solution was company housing. Tanner apparently applied the rules to his own family as well as everyone else and gained respect by so doing. Other things were different, too, according to Dr. Lovelace. “One thing that was different were the diseases. When I first came here we had whooping cough, a lot of diarrhea among the babies, smallpox, diphtheria, typhoid, we had scarlet fever, and we used to see a lot of diphtheria and pneumonia. Now we can prevent most of those things. 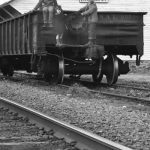 “He had an arrangement by which he would attend to any of the families at the mill at the rate of sixty cents per month. This would be taken out of their pay envelopes at the mill office so that he got his pay whether they were sick or not. He-made his rounds every morning and anyone on his list could call him in and he would prescribe without any additional pay. This, I understand, is the Chinese method. They pay their doctors to keep them well, which seems to be a sensible idea,” Ivey says. In 1927 the mill was sold to the Martel Company, and life in the village slowly began to evolve. Schools were built. 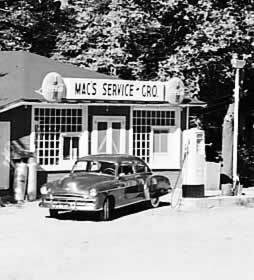 The emergence of the automobile made it possible to close the company store in 1948. In 1957 the mill was bought by Burlington Industries, and in 1958 they sold the company owned houses. 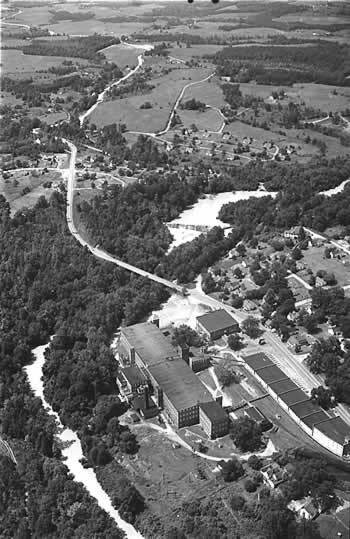 The mill has continued to make gauze fabric throughout, and was never completely closed down, either during the depression years or the war years, according to Mrs. Frances Spratt, a local historian who wrote the script for a historical filmstrip of Rutherford County as a bicentennial project. But now it is closed, but Dr. Lovelace said he thinks most of the people in the community will stay. “Some are drawing unemployment, some are working off, some are looking for work, they’re just sort of scattered like a covey of birds. But most people own their homes, and they won’t move away. A lot of people are retired. “We’re hoping some other company will come in and start it up again,” he said. From the This Week section of the Forest City Courier-Sun, December 21, 1977. Clipping courtesy Phillip White. The old mill Just days before being razed. “The Corner” at Henrietta. The store and bank building was built by R.R. Haynes. A closer look. The man standing in the doorway appears to be Robert E. Haynes, R.R.’s son.